Port with permission of Version 0.91 for New Vegas. uploaded a new .esp that allows moving fixed objects. This is an option in the Books menue under advanced options. It is turned off by default and you have to turn it on for fixed objects to "light up" and be selectable with FS! Since its an esp only, the assets from the previous version are needed. This version is propably the farthest i can/will go as far as porting FS goes. uploaded a file named "Feng Shui NV.esp". The first release was "Feng ShuiNV.esp". Just a cosmetical issue that will casuse the items you locked to get unlocked and having to be re-placed and re-locked. This was done to correct an oversight by me and future versions will be called alike. So this is (hopefully) the only time this will occur. Sorry for the inconvenience. No update in functionality yet. included the correctly named esp in the main file and removed the redundant optional file. This is the port of Version 0.91 ... with the addition of being able to move fixed objects. Object spawning not included. - Object Scaling. Use Shift + Trans/Rotation Mode to enter Scaling Mode. Use +/- x, y, or z to change object scale, Reset (while in Scale Mode) sets scale back to 1 (normal). - Finer Nudge Mode. The Nudge Mode key now cycles between Mini Nudge Mode, Micro Nudge Mode, and Nudge Mode Off. - Rotate 45 Degrees. Hold Shift while in Rotation Mode to rotate objects in increments of 45 degrees. - Optional Hotkey Menu Access. Use the console command "StartQuest FengShuiMenuAccess" to enable hotkey access to the Feng Shui Book menu (default key "P"). - Customizable Hotkey Controls. 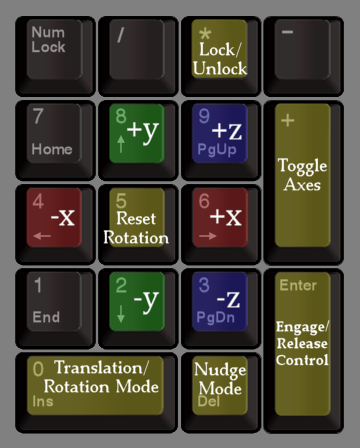 See the included file "Feng Shui - Keymap Plugin Instructions.txt" for full details on creating a custom keymapping plugin (recommended method) or changing control settings through the in-game console. - Added "Locking" sound when locking objects. - Added FOSE version check. 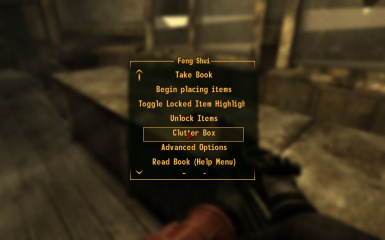 - Clutter Box added to book menu (still has default hotkey as well). - No longer disables Z-Grab while controling and object. - Feng Shui Book item now silently added to inventory during initial game Vault stages. - Axes remaining if item taken while under FS control. - Z-grab disabled if item taken while under FS control. - Blue glow on current valid crosshair target remaining when ending FS session from inventory. - Ability to use Feng Shui on fixed objects. - More and better organized clutter for the Clutter Box. - Improved Feng Shui Books. Feng Shui gives you new abilities and precise control when it comes to arranging movable objects in-game. If you find getting a Nuka-Cola to stand up with Z-grabbing... frustrating, Feng Shui may be for you. In addition to precise control over an object's position and orientation, it can be locked in place indefinitely, even in places it would not remain normally due to collision with other objects or lack of support. This means you can arrange items very close together, make them appear to actually rest on a surface (instead of floating above it in many cases), mount them on walls, or even suspend them in mid-air. You can also further adjust a locked item at any time, or unlock it if you wish. Objects manipulated or locked by Feng Shui are never modified in any way, so you need not worry about any of these items not behaving as otherwise intended. *Please note: Any system for manipulating objects in 3D will feel awkward at first and take some getting used to. Please take a moment to look over the Movement Controls in this readme, study the Control Diagram, and view any demo videos before using Feng Shui. This will greatly improve your initial experience. 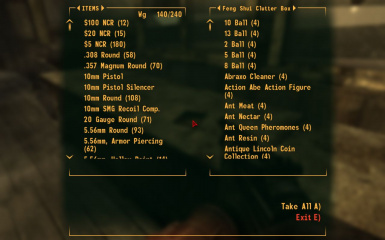 1) Extract the archive into your "Fallout new vegas\Data" folder. 2) Using FOMM, activate the plugin "Feng Shui.esp" in your load order anywhere after all ESM files. 1) Deactive and remove the plugin. 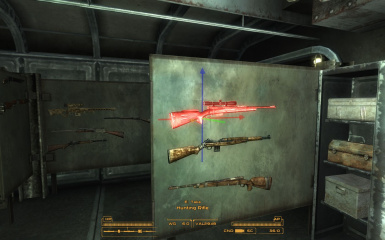 2) Remove the folders "Fallout new vegas\Data\Meshes\FengShui" and "Fallout new vegas\Data\Textures\FengShui". 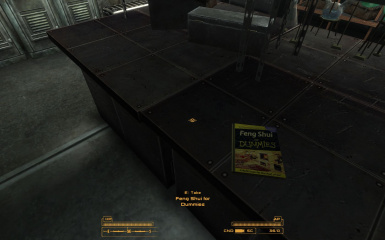 When loading a game for the first time with Feng Shui installed, a book ("Feng Shui for Dummies") is added to your inventory, appearing in the "Aid" category. 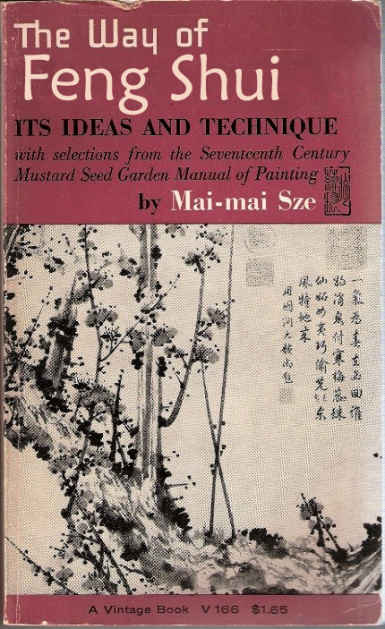 You'll use this book to begin and end Feng Shui sessions - you can either "Equip" it while in inventory or "Activate" it while on the ground to access the menu. To start a session, choose the option "Begin placing items". Now as your crosshair hovers over anything that is normally Z-grabbable, that object will pulse with a blue glow to indicate it can be manipulated with the Feng Shui controls. You can now arrange any number of items, and further adjust/unlock previously locked items. When you're done, select "Stop placing items" from the book menu. A Feng Shui session will also end automatically if you move too far from the spot at which it was started (about 50ft/15m), or if you enter combat. All movement controls are on the keyboard numpad. In addition to reviewing this section, please use the Control Diagram included with these files as a reference. 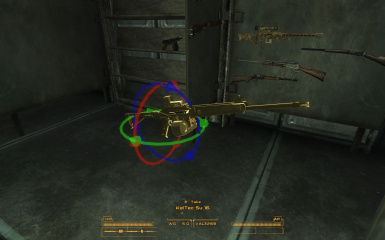 When you first "cast" Feng Shui on an object, it's glow will change from blue to yellow, indicating it is under Feng Shui control and no longer subject to game physics. You can now precisely manipulate the item with the FS controls. If you release control of the item (NumEnter) goes back to normal game physics and will settle or drop as usual if not supported. If instead of releasing control on the yellow glowing object you lock it (Num*), it will remain fixed in place indefinitely. If you wish to adjust the locked item's position further, simply cast Feng Shui on it again (target then NumEnter). It will now be pulsing red, indicating it's locked status, but you can use the FS controls just as before. Releasing control (NumEnter) will leave it in its new locked position. If you want to unlock an already locked item - to allow it to settle naturally, or for whatever reason - engage Feng Shui control of it again, then press the lock toggle again (Num*). The object will change from pulsing red to yellow, and when you release control (NumEnter) it will behave normally again. Another way to remove locked items is to activate them, taking them into the player inventory, as you would normally. "Begin Placing Items"/"Stop Placing Items" - This activates or deactivates the ability to use Feng Shui controls. Note that you don't have to remember to choose "Stop placing items" when you're done using Feng Shui - if you move more than about 50ft/15m from where you activated it, or move between interior and exterior cells, it will deactivate automatically. "Highlight Locked Items" (toggle) - When active, any Feng Shui locked items in the currently rendered scene will be indicated with a steady red glow, and the number of those items is displayed in a status message. "Unlock Items" - Will indicate the number of Feng Shui locked items in the currently rendered scene, and prompt you to unlock them all at once. Those objects will immediately settle or drop, subject to normal game physics. "Open Clutter Box" - Summons the Feng Shui Clutter Box, containing a large assortment of things to decorate with, including rare and new objects. "Read Book (Help)" - Displays basic instructions on how to use Feng Shui. - Show locked item list: For debugging purposes, the list of locked items in the current scene can be output to the console screen. This can be done at any time during a Feng Shui session by pressing Shift+NumMinus (Num-). A VATS beep will indicate the list was printed. You can also get the same list by typing "StartQuest FengShuiShowList" in the console. - Feng Shui Clutter Box: (Now also on the book menu.) Don't have anything nice to decorate with? Take a look in the magic Clutter Box! During a Feng Shui session (but not while controlling an object) press Shift+NumPlus (Num+) and you'll have access to all the game clutter and more. To avoid potential problems, there are no scripted or quest items in there (well, there shouldn't be), but there are copies of any that have unique models. Don't put anything in this container that you don't want gone forever, as it resets and respawns each time it's opened. And don't use it to cheat, ok? - Bottlecaps for decorating: Normally you can't drop bottlecaps from your inventory. Now you can by pressing Shift+NumDecimal (Num.). Like the Clutter Box, this only works while Feng Shui is active but while you're not controlling an object. Some walls, furniture, and other objects may have larger collision boxes than you realize. If you use Feng Shui to lock an item very close to one of these, it's possible it could be mostly or completely inside the invisible collision box, preventing access to the locked item by normal means. One specific example is the wall behind the Bobblehead Display Stand in the Megaton Player House. Because of this, before you begin arranging and locking items somewhere (especially if planning on mounting things on walls), I recommend using the console command ToggleCollisionGeometry (tcg) to view the collision boundaries in the area (entering tcg again returns your view to normal). This can help you avoid problem areas, or at least be aware you'll have to take extra steps to get a locked item out of such a spot. 1) Open the console, and see if you can select the object by clicking on it with the mouse cursor so the object's name and reference ID is shown at the top of the screen. If directly clicking on it doesn't seem to work, try using the mouse wheel - this cycles through a few references which may include the object in question. 2) If you can't get the reference to show up this way, use the "Show locked item list" debug feature as described above ("F) Extra Features" section). 5) When you close the console again, the object should appear near your feet. You can also try using the the console command ToggleCollision (tcl) which may allow you to move into a position so you can target the locked item with Feng Shui - you can then move it back to a safe location. - This will conflict with any mod that also attempts to use any of the same Numpad hotkeys during GameMode. Refer to the included file "Feng Shui - Keymap Plugin Instructions.txt" to customize the Feng Shui controls if necessary. - See the section "G) Warnings", for notes about retrieving inaccesible locked items. 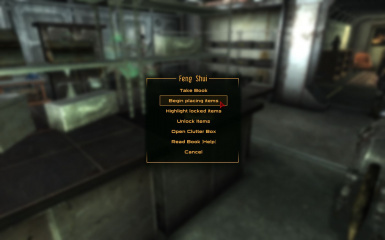 - If using FOSE v1.2b2, saving during an active Feng Shui session may cause a crash. Updating FOSE to v1.2b3 should fix this issue (download link). Reports of this or any other issue resolved with FOSE v1.2b3 are appreciated. - If rescaling objects enabled by a Parent Reference (such as items that are part of a House Theme), their collision boundaries will not be reset. This can be avoided by taking then dropping the item before scaling. - A pre-release tester reported a crash when moving an object into the floor (in a Player House mod), but I was unable to replicate or find cause for this. 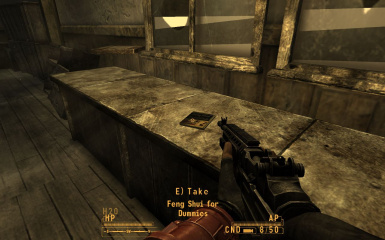 Feng Shui benefits from two key methods used in beancounter's "Decorator Assistant" (Oblivion) and TGBlank's "Blank's Magic Hand", respectively. If I had not been able to examine how each of these mods work, it would have taken much longer to develop Feng Shui, and quite likely it would not work as well as it now does. Thanks to both beancounter and TGBlank for creating these mods and making them available to the modding community. Further thanks to beancounter, as his Oblivion mod "Decorator Assistant" was my original inspiration to attempt this project - in fact, the first mod I had ever thought about trying to make, before I had even downloaded the GECK. Special thanks to Cipscis, for - as always - allowing me to expound upon all the problems I encounter with my code or the FO3 engine, and if in the process I haven't already figured things out on my own, for then giving me a solution or thoughts on what to try. Thanks to titan357, Balok, and especially BulletSix for helpful pre-release testing and feedback. Thanks to Ian Patterson (ianpatt), Stephen Abel (behippo) and Paul Connelly (scruggsywuggsy the ferret) for the Fallout Script Extender (FOSE). Feng Shui wouldn't be nearly as nice without some of the things they've made possible through their work. Thanks to Bethesda Games Studios for Fallout 3 and the GECK. You must obtain permission before redistributing these files as-is. You may use the methods in this mod in any other freely available mod, but please notify me and give credit where appropriate. Thanks! Any other usage requires express permission.